I have TWO books coming out at the end of July. 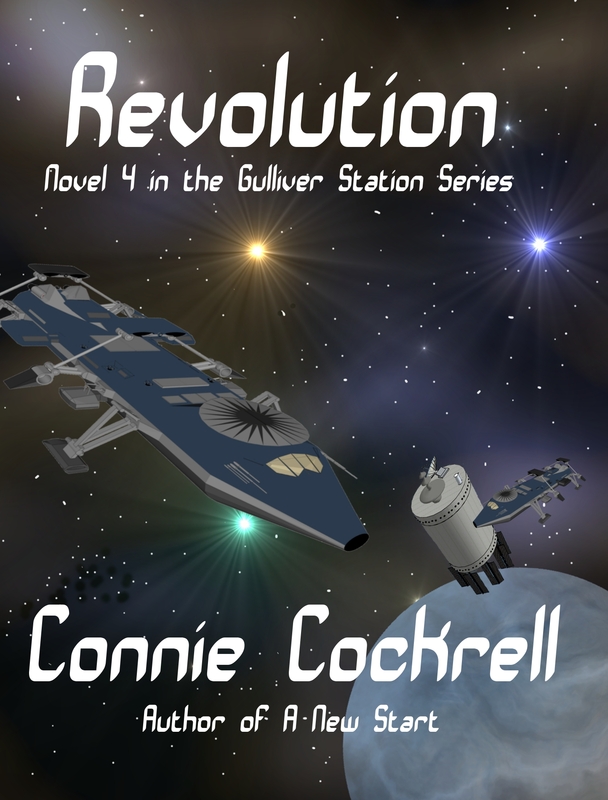 One is the final book in the Gulliver Station series, Revolution. The second is the first book in a new series, a dystopian science fiction about two young women, one of whom is very special, who set out to heal the world. 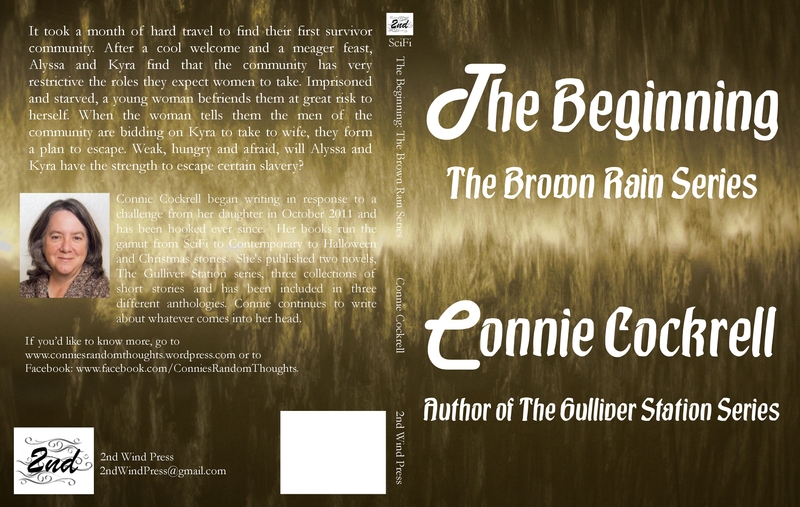 It’s called The Beginning: A Where The Brown Rain Fell series. I’m writing the second series in conjunction with a writing class about series. I’m very excited to both finish one series and start a second one. So the covers. The first is, obviously, for Revolution. The second is for The Beginning, The Brown Rain Series. Under each cover is a snippet of story for you to enjoy. Sean and Darin stood to Kenna’s left behind her. The Beginning Cover (Draft) Tell me what you think about it. Would you make any changes? “I think so, too.” Kyra pulled the string back just a hair more and fired at the center dog. The dog screamed and flipped around as the arrow hit him in the middle of his chest. She turned and pulled a new arrow in one fluid movement. The first dog was charging. She could hear Alyssa scream, “Look out!” behind her. The first dog was five feet away when Kyra pulled the bow and shot the dog in the neck. She dropped the bow and pulled her boot knife while spinning around to Alyssa. The last dog was in the air, a snarl sounding as it leapt straight for Alyssa’s face. Kyra threw her knife, hitting the dog in the ribs and knocking it aside. It yelped and rolled. Kyra grabbed Alyssa’s knife from her hand where she was frozen with fear and charged the dog. It rolled to its feet and crouched, ready to lunge, it’s mouth in a snarl and teeth ready to tear her apart. The blood pounded in her ears as she circled the dog. The thing must weigh about fifty pounds, she thought. It’s wounded. I can do this. It leapt, her knife falling out of its ribs. She slashed at the throat, as she braced herself in a crouch for the impact. The knife slashed the animal but not enough. It yowled as she spun to get out of its way. She crouched again, knife ready as the dog hit the ground, spun around and leapt at her again. This time she let the creature hit. It snapped at her, its breath foul in her face. From her left she could hear a yelp. Alyssa! screamed through her mind but she had to deal with this dog first. Holding the dog’s throat with her left hand, she swung with all her strength for the dog’s ribs with her right. The knife plunged into the dog, she could feel the blade scrape a rib as the knife went in up to the hilt. She pulled it out as she rolled over, the dog thrashing, and on top, she stabbed it again. The dog screamed and she rolled to her feet in a crouch. Where’s Alyssa! Like any author, my books sell based on reviews. Would you be interested in getting a free copy to review for me? Go to the button on the right side of the blog or go to my Newsletter tab to sign up. Or sign up here. Use Control, Click to access the link. Let me know you’d like to be a reviewer on the e-tailer or Goodreads site of your choice. Hard Choices: A Gulliver Station Story released May17th! I’m pretty excited about it. You can buy at: Apple, Amazon, Barnes and Noble, Kobo, or Smashwords today!